That's 'big' as in 'big dot.' the author runs express sights against the traditional post/notch system. 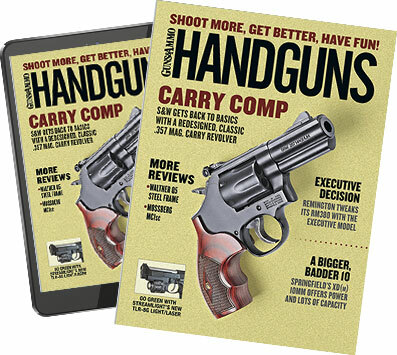 It's struck me in recent days that I have never given the handgun express sight system designed by my friend Ashley Emerson a serious workout. This gaping hole in my firearms expertise demanded to be filled, so I decided to pit conventional post/notch sights against the express sights--both for accuracy at distance and for speed in-close. Ashley Emerson first approached the idea of this design as a way of adapting the sights commonly found on African express hunting rifles to handguns. As Ashley put it, "This is what serious hunters use when they're expecting to run into something dangerous that jumps out at them at close range and tries to kill them. That sounds an awful lot like self-defense, doesn't it?" Handgun express sights were originally offered for sale by Ashley Outdoors; currently they're available through XS Sights (xssights.com, 888-744-4880). Actually, the original "big dot" design is today called by XS the "standard dot" because it was soon joined by an even larger dot (which is today specifically referred to as the "big dot" to differentiate it from the standard dot, although I'll refer to this type of handgun sight generically as "big dot" since that's the common terminology). Both the standard dot and big dot are available with or without a tritium insert for low-light shooting. Sights consist of a round white dot up front and a wide, shallow V-notch rear with a white, vertical line in its center. To align the sights, place the dot on top of the line so it looks like a lollipop. In close, cover what you want to hit with the dot. At distance, use the top of the dot like the top of a front sight post with conventional sights. I've heard two common statements regarding big dot sights versus post/notch--one pro, one con. People say it's much faster to just sit that huge white dot in the center of the shallow V-notch than to have to look through a tight rear notch at a front sight blade with conventional sights. At the same time, I hear people say that big dots are okay in close, but they're impossible to use with real accuracy at any distance. I have to say, right off the bat, I don't buy that "impossible to use at distance" stuff. I've seen footage in a Paladin Press video of firearms instructor/champion shooter Andy Stanford--a proponent of big dot sights on carry guns--firing at a steel plate 25 yards away with a big dot-equipped 1911 .45, running full power hardball, hitting the plate with every shot and not exactly taking all day to do it, either. There is some truth to the "it's slow to peer though a tight rear notch" argument, but that holds water only if your post/notch sights have a tight rear notch. Decades ago, for some unknown reason, makers of "high visibility" (which aren't) pistol sights settled on front post and rear notch widths of .125 inch as standard. Thus you have a fat front sight blade filling a tight rear notch, generating a horribly cramped sight picture, with very narrow light bars on either side of the front blade when centered in the rear notch. This makes it very difficult to pick up the front sight fast and stay on it during rapid fire. The author compared his Warrant Tactical Series-Sevigny Competition blade sights (left) with the "big-dot" sight from XS. The solution, of course, is a narrower front sight combined with a wider rear notch for more generous light bars. My favorite fixed sights for a carry gun are the Warren Tactical Series-Sevigny Competition design (WTS for short). The "Warren" and "Sevigny" in the name are Scott Warren and Dave Sevigny, both USPSA Grand Masters and IDPA Masters, both of whom have won the IDPA nationals in the past. And I don't mean they just won their division of competition (though they did, of course); they had the high score of all divisions combined. On top of that, Warren is the head firearms instructor for the FBI's Hostage Rescue Team.Sight width on these sights is .115 inch up front and .150 inch to the rear, for an excellent, highly visible sight picture. Fellow Handguns scribe Dave Spaulding has pointed out that the human eye takes more notice of brightly colored objects than dark objects. Dave is a fan of brightly colored front sight blades. I am, too. Thus the crowning touch to the sights of any gun I carry concealed comes from a 99 cent bottle of daylight fluorescent orange nail polish applied to the front blade. For years my carry guns have been Glock 9mms. At the time of this article, that equaled a lightly customized Glock 17. In addition to WTS sights, my G17 has also been fitted with a New York Trigger, and I had the trigger action polished following the procedures set forth in the "Making Glocks Rock" DVD from the American Gunsmithing Institute. The trigger pull is now five pounds even. I tweaked the magazine release button spring slightly, making the button easier to depress (it's a bit stiff on a stock Glock) and installed one of Lane Pearce's grip frame plugs. Ladder tape (the stuff found on the treads of aluminum stepladders) has been applied to both sides of the grip, plus a small strip under the trigger guard and on the backstrap. Unaltered ladder tape is too rough to allow my hand to slide into place on the draw, so I actually blunt its texture with a file after cutting to shape and before application. I find ladder tape superior to skateboard tape because the latter is made of paper (it's basically just sandpaper with adhesive on the back) whereas ladder tape is much more durable. For this testing, rather than firing one gun with WTS sights, then having to remove those and install big dots to test both sight systems, I asked Glock to send me a second G17, then set it up exactly like my own but with an XS big dot (I went for the larger version with tritium insert) instead of WTS sights. Trigger pulls after massaging this gun also came in at five pounds even. Thus I wound up with two essentially identical Glock 17s for this test, the only difference being the sights. Thomas discovered that the traditional post/blade sight is, for him, indeed a bit better for shooting at distance. ht types at reasonably long range, I fired six five-shot groups from the bench at 50 feet--the maximum distance possible at the indoor range where I do most of my shooting--with both guns. Initially the XS sights shot high left, however my MGW Glock sight pusher from Brownells made short work of the windage discrepancy. A bit of experimentation with sight picture brought groups down to point of impact/point of aim for elevation as well. I found it took a fair amount of attention to sight alignment--as in, how low to ride the dot inside the notch--to zero groups at 50 feet. However, once I had the right sight picture memorized, it was no more work than doing the same thing with post/notch sights. Best group with WTS sights was 1.9 inches, average was 2.4 inches. For the XS dot sights, best effort was 2.6 inches, with an average of 3.2 inches. However, honesty compels me to admit this average was inflated considerably by one absolutely egregious 5.4-inch group on my part. If we were to exclude that one group from the calculations, average big dot group size would be 2.8 inches. So there does appear, in my hands at least, to be a difference in accuracy potential for the post/notch combo over the XS dot sights. However, it's worth noting that this was my first-ever time firing these sights. It's quite possible that more experience with the system might shrink groups significantly. I might also mention I was not feeling particularly in the groove during this range session. In the past I have fired numerous groups of around one inch with 9mm Glocks with post/notch sights. Not this time, though. I moved in to seven yards for the second part of the test, during which I put both sight systems through the graduation exercises from the Intensive Handgun Skills speed shooting course from InSights Training Center. This is a program of six different drills, five runs apiece, shot on three USPSA or IDPA targets set one yard apart, edge to edge, at seven yards. I used my daily carry gear during this test: a straight drop Blade-Tech standard belt holster with a matching double mag pouch from the same maker, all threaded onto a 1.75-inch black sharkskin-and-horsehide Kramer dress gunbelt I've had for years. Ammo was a mixture of American Eagle and Winchester USA "white box" ball, and when I ran out of that I switched over to my carry load, Winchester 115-grain Silvertips. The first time I ran these guns through the IHS drills, I shot with a white sheet of typewriter paper over the target centers, something I do to extend target life. I found the XS dot sight worked really well on drills starting with the gun already on target, but on any drill requiring gun movement between targets (like fire one shot on two targets) or moving the gun swiftly to the target (like draw and fire drills) I had trouble getting on the sights fast and staying on them between targets. I realized this was because the white dot was getting lost against the white background. I returned later to the range with three brand new buff-colored USPSA Milpark targets. When running both guns twice more through the IHS drills, the dot sights held their own against the post/notch. Frankly I could stand to see XS offer its sights with a different color than white as a option. Here's an overview of how I performed with the sights on the various drills. Drill 1 Double-tap one target. Average shot-to-shot speed: WTS .24 second. XS .24 second. Not a whole lotta difference there. Drill 2 One shot on each of two targets. WTS .37 second. XS .38 second. Drill 3 Fire one shot, speedload, fire one more shot on the same target. This is actually an excellent test of sight visibility since you will lose the sights during the speedload, then reacquire them before firing the next shot. WTS 1.66 seconds. XS 1.82 seconds. A bit more difference here, though I'll be the first to admit it's debatable how important this is anywhere outside a combat pistol match. Drill 4 Ready position. I prefer the Low Ready, with gun aimed at the lower edge of the target as if covering the opponent's pelvis while still leaving his hands visible. At the timer's signal, raise the gun and fire one round to the chest. WTS .40 second. XS .42 second. Drill 5 Draw and fire one shot on one target. WTS 1.26 seconds. XS 1.24 seconds. Drill 6 Draw and hit three targets once. WTS 2.23 seconds. XS 2.21 seconds. At distance the post/notch sights did seem to offer more precision than the XS dot sights, at least in my hands. In fast and close shooting, differences in performance pretty much went away (with the exception of the speedload, which could be easily chalked up to me rather than the sights), with best speed sometimes coming from the post/notch, sometimes the dot, and could be measured in mere hundredths of a second either way. While I have no plans to knock the WTS sights off my own Glock 17, the results of this test have left me convinced that I would never say a shooter who prefers the big dot system is "wrong." Both types of sights can work, and work well.